1.Christine M Field, James F Pelletier, et al. "Disassembly of actin and keratin networks by Aurora B kinase at the midplane of cleaving Xenopus laevis eggs." bioRxiv. 2019 January 06. 2.Shodai Tanaka, Kaori Senda-Murata, et al. 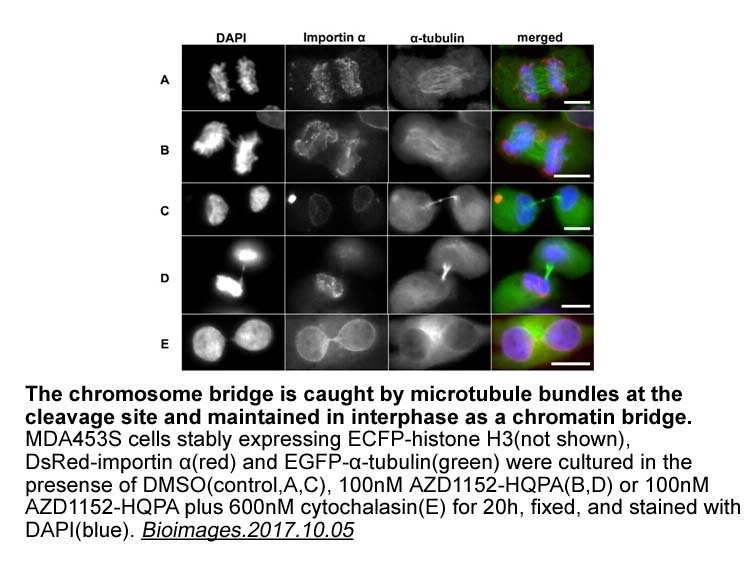 "Live cell imaging of anaphase bridge formation and the subsequent cleavage furrow regression induced by the Aurora B kinase inhibitor AZD1152-HQPA." Bioimages.2017.10.05. Yamauchi T, Uzui K, Shigemi H, et al. 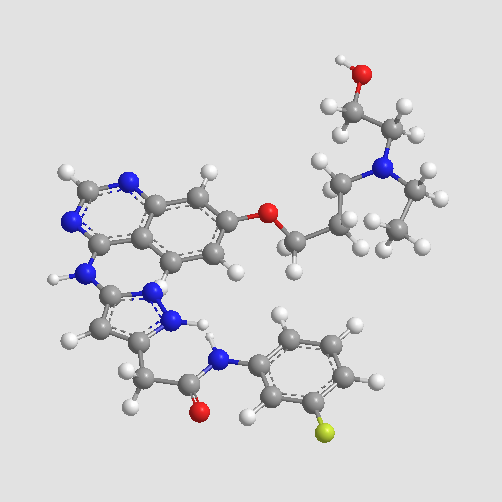 Aurora B inhibitor barasertib and cytarabine exert a greater-than-additive cytotoxicity in acute myeloid leukemia cells. Cancer science, 2013, 104(7): 926-933. Alferez D G, Goodlad R A, Odedra R, et al. Inhibition of Aurora-B kinase activity confers antitumor efficacy in preclinical mouse models of early and advanced gastrointestinal neoplasia. 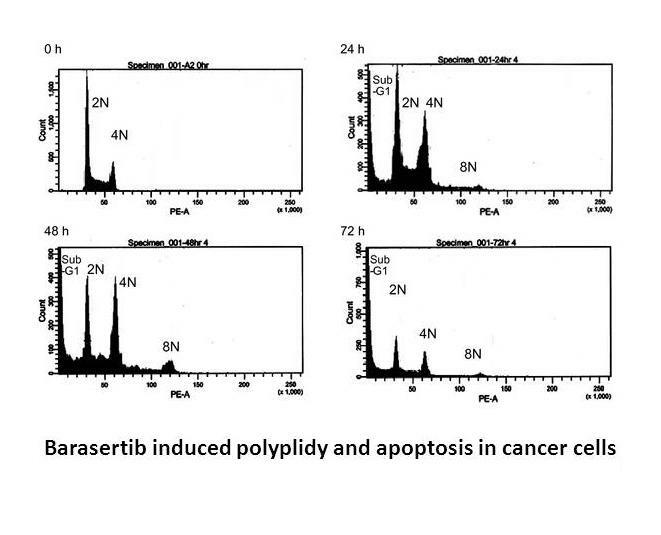 International journal of oncology, 2012, 41(4): 1475-1485. 1. Stage I of a phase 2 study assessing the efficacy, safety, and tolerability of barasertib (AZD1152) versus low-dose cytosine arabinoside in elderly patients with acute myeloid leukemia. Cancer. 2013 Jul 15;119(14):2611-9. doi: 10.1002/cncr.28113. Epub 2013 Apr 19. Barasertib, an Aurora B kinase inhibitor, was evaluated for efficacy, safety and tolerability in AML patients of age > 60. 2. Phase I study assessing the safety and tolerability of barasertib (AZD1152) with low-dose cytosine arabinoside in elderly patients with AML. Clin Lymphoma Myeloma Leuk. 2013 Oct;13(5):559-67. doi: 10.1016/j.clml.2013.03.019. Epub 2013 Jun 10. 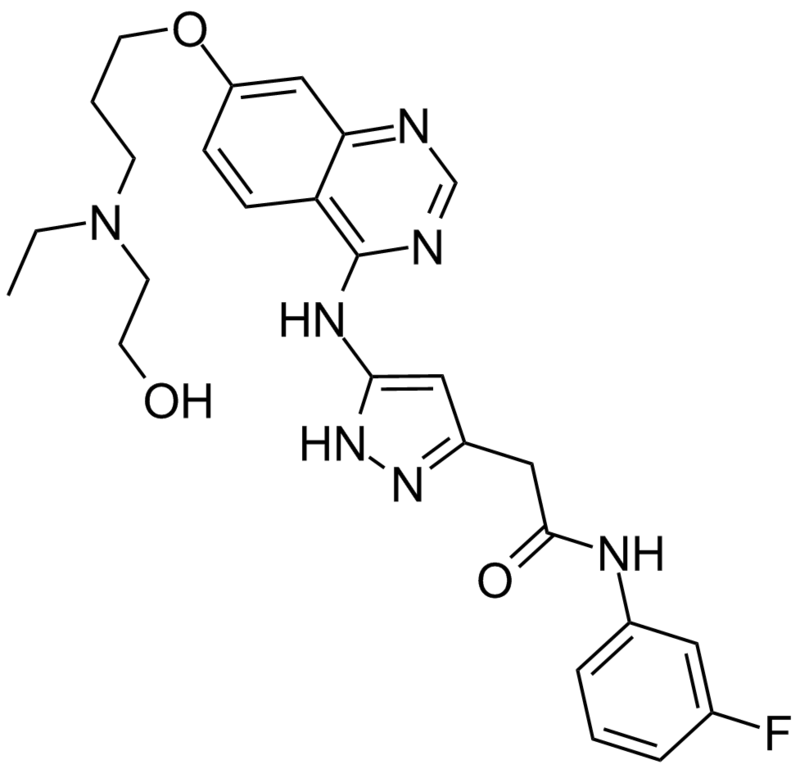 Barasertib is an Aurora B kinase inhibitor with anti-AML activity. 3. 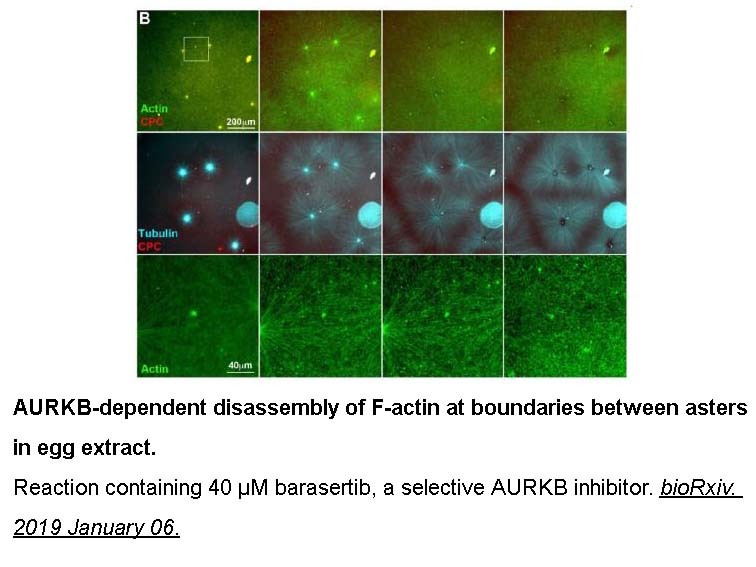 Aurora B inhibitor barasertib and cytarabine exert a greater-than-additive cytotoxicity in acute myeloid leukemia cells. Cancer Sci. 2013 Jul;104(7):926-33. doi: 10.1111/cas.12164. Epub 2013 May 12. 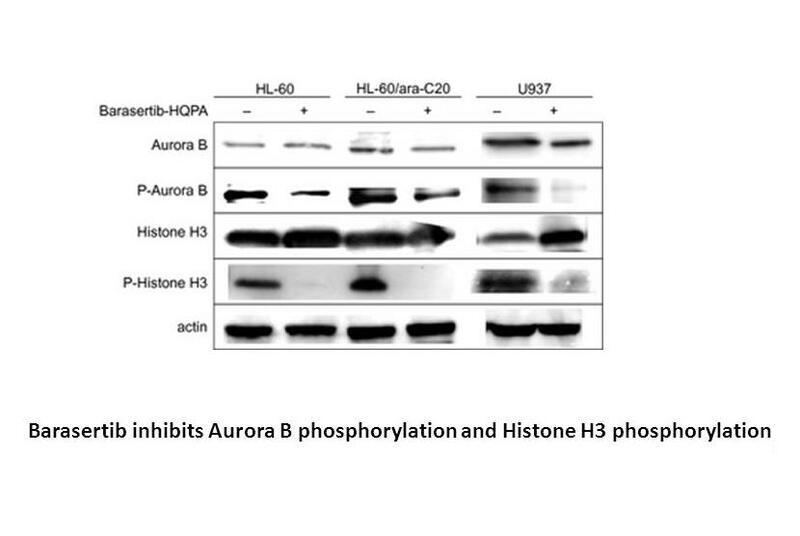 As an active metabolite of Barasertib, barasertib-HQPA is an inhibitor of aurora B that potently inhibited growth of HL cells by inducing polyploidy and apoptosis. In order to provide a greater-than-additive cyctotoxicity to HL cells, barasertib-HQPA must be applied before or concurrently with ara-C.
4. Effect of the drug transporters ABCG2, Abcg2, ABCB1 and ABCC2 on the disposition, brain accumulation and myelotoxicity of the aurora kinase B inhibitor barasertib and its more active form barasertib-hydroxy-QPA. Invest New Drugs. 2013 Oct;31(5):1125-35. doi: 10.1007/s10637-013-9923-1. Epub 2013 Jan 13. Both barasertib and barasertib-hQPA could be efficiently transported by BCRP and MDR1, in which significant barasertib resistance has been observed. MRP2 neither transported barasertibe nor affected its cytotoxicity. 5. 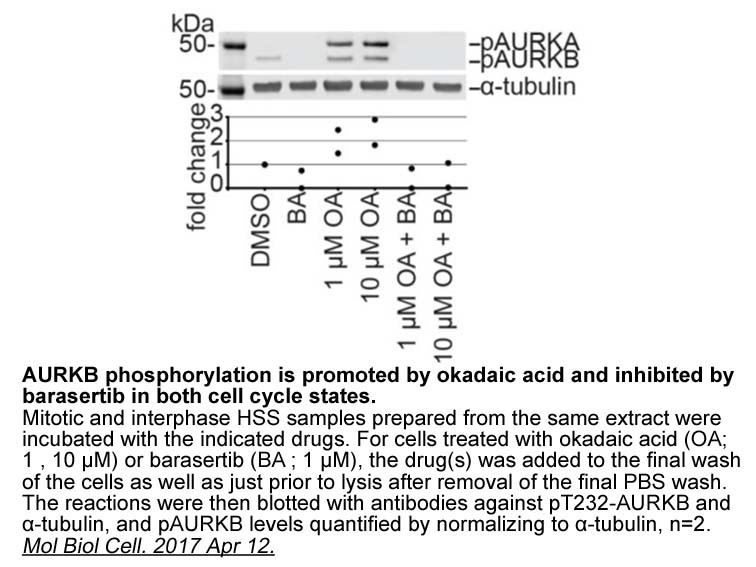 Phase I study of barasertib (AZD1152), a selective inhibitor of Aurora B kinase, in patients with advanced solid tumors. Invest New Drugs. 2013 Apr;31(2):370-80. doi: 10.1007/s10637-012-9825-7. Epub 2012 Jun 2. Barasertib, an Aurora B Kinase inhibitor, was generally well tolerated in patients with advanced solid malignancies with MTDs of 150 mg and 220 mg for 48-h continuous infusion and two 2-h infusion respectively, which caused neutropenia as the DLT and mild to modest adverse side effects of hematologic or gastrointestinal etiology.